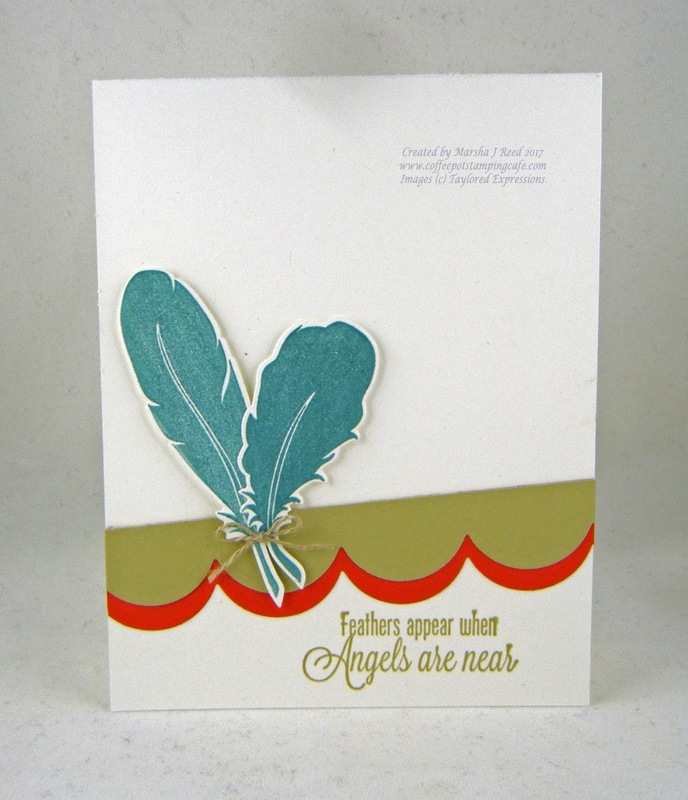 Today I have for you a clean and simple card showing off my Light as a Feather Stamp & Die Combo from Taylored Expressions. While I did have the Baja Breeze and River Rock colors, my red is not Riding Hood Red as I'm out of it. I substituted a red but I'm not sure which color it is as it was a scrap in my left overs box and it looks more orange in the photo than what it really is. And, as you can see, I have this little spot going on at the top of my photo. I'm not sure if that means there is dust within the lens as I've cleaned everything twice now and it still shows up. Sigh... I'm hoping it doesn't mean that my camera is wearing out. Now I'm off to run some errands while the sun is still shining. It's been gloomy and cloudy the last few days and the sunshine is a welcome relief. The colors and sketch that I used are from the CAS Colours & Sketches Challenge. For all the challenge details and to share your project, click the image below. Fun card! Wonderful use of the colors and I love the scallops! Thanks for playing along with us at CC&S! Great use of the colours and sketch. Love the feathers tied together. Thanks for joining us for this week's CC&S challenge. Thanks, Patricia! I forget I have that scallop die so I don't use it nearly enough. I love how you have used the scallops for the sketch and the cute little bow on the feathers. Thanks for sharing with us at CC&S!